Disclosure: By posting this recipe I am entering a recipe contest through The Recipe ReDux sponsored by Wonderful Pistachios and am eligible to win prizes associated with the contest. I was not compensated for my time and as always, opinions are my own! Thanks for supporting the brands that make the Shaw Kitchen possible! What’s your current obsession in the snack bar category? Lately, the answer I’m getting from clients is “RX Bar”. If you don’t know what that it is, it’s basically dates, egg whites, and nuts combined into a flat, slightly sticky bar. The cool thing is that it’s void of added sugar and has a variety of flavors that really suit every palate depending on your preference. But, one flavor I noticed they have yet to conquer is the trendy Mediterranean with the textures and tastes of pistachios, tahini and good old fashioned whole grains! Then, it hit me. That’s exactly what I needed to come up with for The Recipe ReDux’s sponsored content with Wonderful Pistachios. If you couldn’t tell, my love for pistachios and my working relationship with the Wonderful Company has me giddy for The Happy NutTM! Just in case you missed them, here’s a few of the top pistachio recipes from the Shaw Kitchen. Now that we’ve cleared the air, I think it’s important we chat real quick about why Wonderful Pistachios are such a stellar nut. Pistachios are known as The Fit NutTM because they are one of the highest protein and fiber snack nuts that are part of a heart-healthy lifestyle. Scientific evidence suggests but does not prove that eat- ing 1.5 ounces per day of most nuts, such as pistachios, as part of a diet low in saturated fat and cho- lesterol may reduce the risk of heart disease. In-Shell Pistachios are known as The Mindful NutTM because they may help you “fool yourself full” because the leftover shells may provide a visual cue for portions, potentially helping to curb intake. We call this the Pistachio Principle. One preliminary behavioral study found that participants who consumed in-shell pistachios ate 41-percent fewer calories compared to those who consumed pista- chios without the shell. 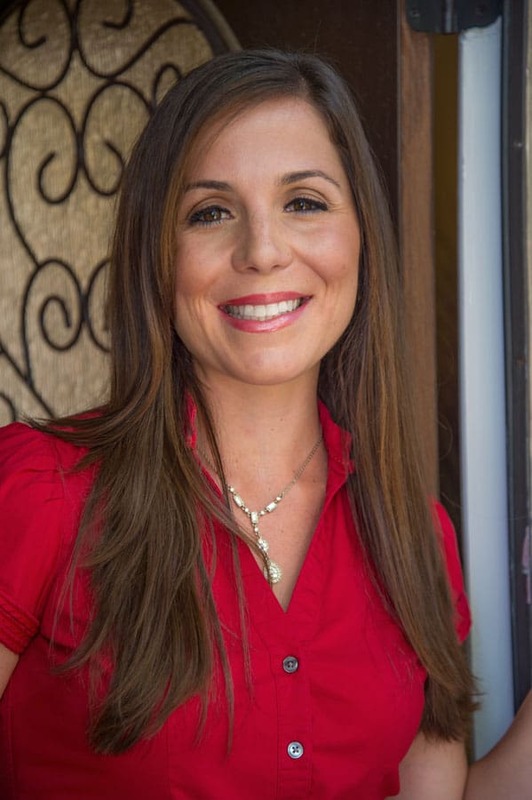 Those who chose the “no shells” pistachios consumed an average of 211 calories, while those who chose the in-shell variety consumed an average of 125 calories, suggesting that empty shells may provide a visual cue for portions, potentially helping curb intake. Pistachios are known as The Colorful NutTM that help you snack colorfully: pistachios’ green and red- purple hues come from antioxidants. Pistachios are The Happy NutTM because you don’t snackrifice – snack happy: pistachios offer great taste AND good health (and pistachios smile back at you). 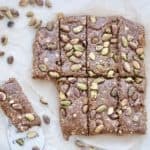 So, to summarize, if you want to snack happy and enjoy some crunch, color and delicious flavor, these Pistachio No Bake Snack Bars are exactly what you need in your life! To a food processor fitted with a metal blade, add dates and process 30 to 45 seconds until pureed. Add in Wonderful Pistachios and oats, pulse in 15 second intervals 2 to 3 times until crumbly, coarse consistency achieved. Place the pistachio butter, applesauce and vanilla extract into the processor and pulse remaining 20 to 30 seconds until dough is slightly sticky. Line an 8 x 8-inch pan with parchment paper. Using a spatula remove dough from processor and pour into the pan. Press down firmly to evenly distribute dough in the pan with another piece of parchment paper. Lift paper up and place evenly throughout remaining 1/4 cup of no-shell Wonderful Pistachios onto the top of the dough. Place pan in the freezer with parchment paper on top and free for at least 1 hour before cutting. Slice into 8 bars and store in an airtight container in the refrigerator for up to a week. To make pistachio butter, take 1 cup no-shell pistachios and place in a food processor with 1 teaspoon vanilla extract. Process for 3 to 4 minutes, whipping down sides as needed, until smooth. Dough will be sticky but don't worry, once you put it in the refrigerator it will firm up! Best when consumed within 5 days. 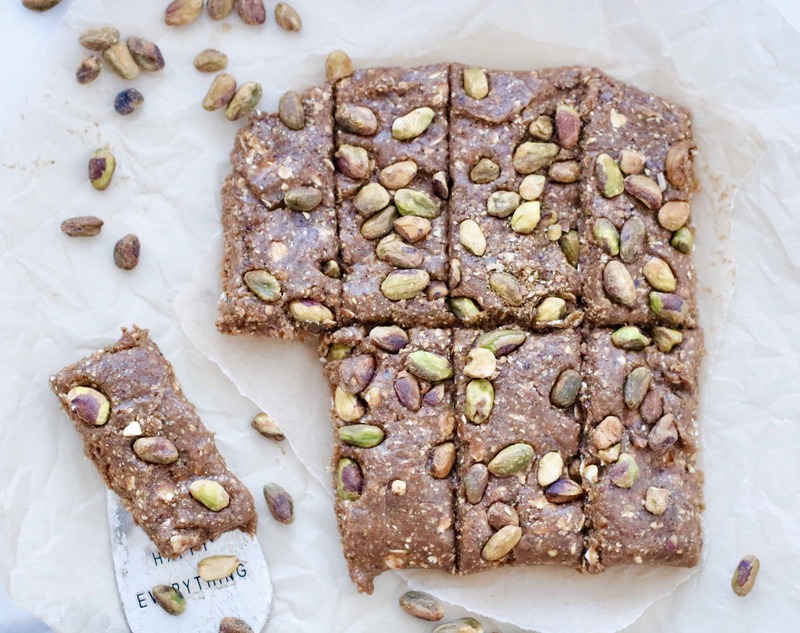 For more recipe inspiration with Wonderful Pistachios, visit The Recipe ReDux link up below! No bake nut bars are the best! I need to try this recipe out. Thanks Jenna! So simple too! 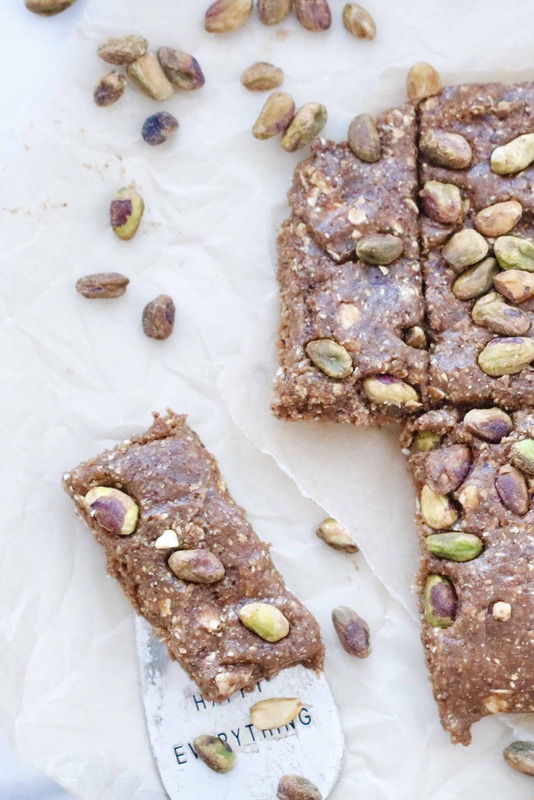 Loving all the flavors you got going on in these NO BAKE bars – win-win! Thanks Deanna! So easy to make, too! Totally making these….and with a sprinkle of sea salt on top! So so yum! and the best no bake variety that you can whip up with the little ones! 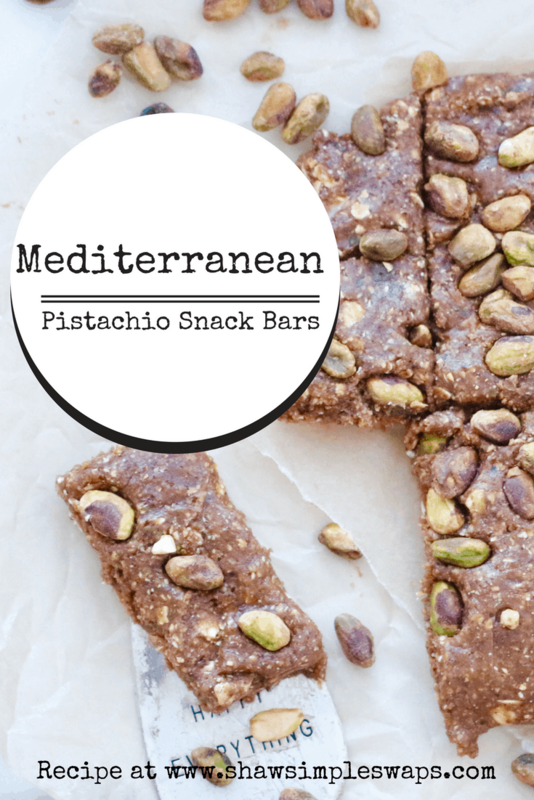 I love pistachios so this will make a great quick snack for on the go or travel! Loving all these Mediterranean flavors! When we went to Greece one of the islands we briefly visited was Aegina and pistachios are so special there and literally tied to the island’s identity. Aegina pistachios are actually a Protected Designation of Origin product by the European Union! Pistachios were EVERYWHERE and this bars remind me of them! OMG. so cool! I had no idea! And please, TAKE ME BACK TO GREECE! Ohhhh I love that I can make my own bars like this at home. I can’t wait to try this recipe, Phil LOVEs pistachios! My kind of snack right here! And I have a ton of pistachios in the pantry! Love these no bake bars! YUM! Making these today so I have for snacks the rest of the week – thank you!! These are sooooo good! Will be making pistachio butter again in the future too, so yum!